Florida lakes and ponds are the habitat of a wide variety of fish, aquatic animals, birds and insects. These animals all have a purpose in nature and were living in our lakes long before man ever entered Florida. If you own lakefront property, you must know that you are living on or very near a wild creature’s home and you must to learn to coexist. Florida lakes are the home of many beautiful and wonderful bird species. Most of these birds live off of the food they find in the lake. Some are migratory and others are year-round residents. Egrets, Ducks, Coots, Ospreys, Eagles and wading birds of all kinds can be found here. 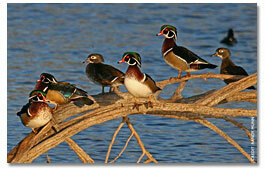 Wood ducks are especially beautiful and the State has worked to create specialized habitats for these birds. The wooden boxes you can see attached to the trees around the lakes are artificial homes for these ducks. It is not a good idea to feed water birds. These birds have specialized diets and human food is not a good substitute. Alligators are a protected species in Florida and were endangered until the last twenty years or so. Alligators are generally docile creatures and usually stay away from boats and people. The problem is that people don’t stay away from them. Feeding, teasing or approaching an alligator is bad business. The State of Florida removes large alligators from its waters if they become a nuisance or shows signs of becoming aggressive. There have been no documented cases of water skiers being bitten by an alligator while skiing in Florida. Snakes are present in every Florida freshwater body of water as well as on land. Most Florida snakes are harmless and no Florida snakes are aggressive, unless disturbed or provoked. Brown water snakes are not poisonous, but do look menacing. Fortunately, poisonous snakes are a rare encounter in Florida anymore and most reported moccasins are just harmless water snakes. The best advice is to leave all snakes alone. The snakes and alligators will appreciate your kindness and avoid you at all costs. If you have questions about Florida lake wildlife, please contact us.